The yearend signals the start of the wedding season and this is when you need to watch out for the new trends in bridal wear. Well, after all your wedding day is the most important day of your life and looking trendy is something you do not want to grudge yourself. So let’s take a look at the trends that will make a bride’s day and others turn heads! 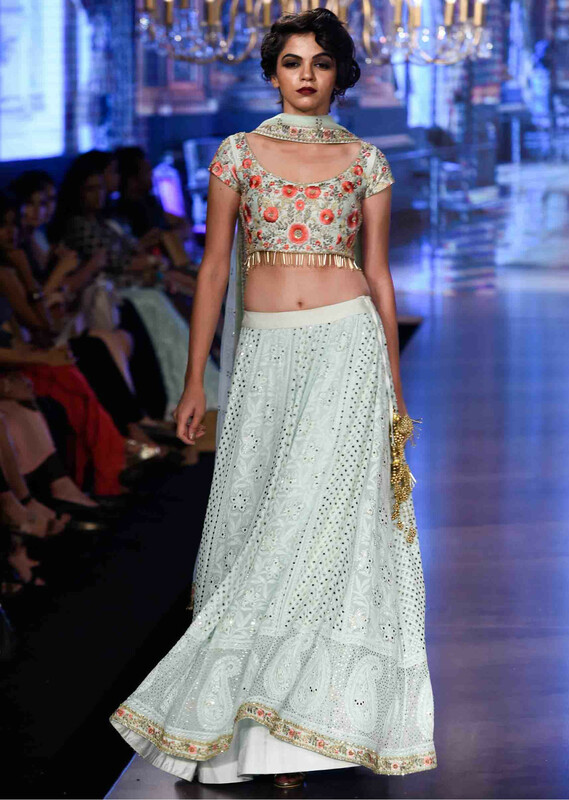 This wedding season, the regular lehengas have gotten a major upgrade in terms of style and silhouette. 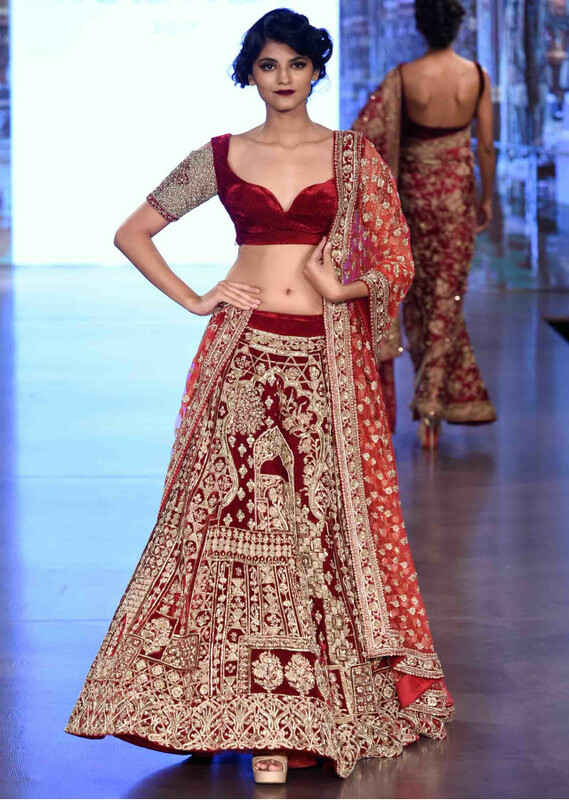 The uber fashionable cape lehengas are the most stylish accessory to hit bridal trends since the dupattas are last year. There are long capes, half cape sleeves, front short long back capes and many more that accentuate your style. Capes might be sheer and stylish, but it manages to block out the cold and should make it as a must have goal for every to-be brides. Women are now going for different silhouettes for various different functions. 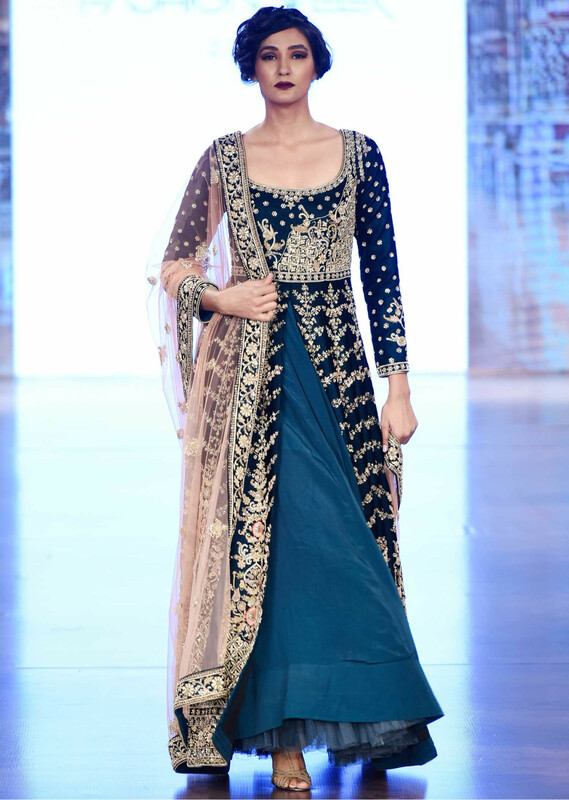 “For the sangeet, floor length anarkalis or an anarkali lehenga with the in-vogue jackets teamed up are the rage. An embellished or embroidered net gown with lacy full sleeves on a cocktail party is also in. Picking up something in this season’s hot colors, like toasted almond, strawberry ice, scuba blue, peachy pinks is trending. For the cocktail, throw on a Victorian Cape gown which is elegant and regal at the same time, in shades like dusty green, royal blue, corals or even an orange cape as a mood-changer. 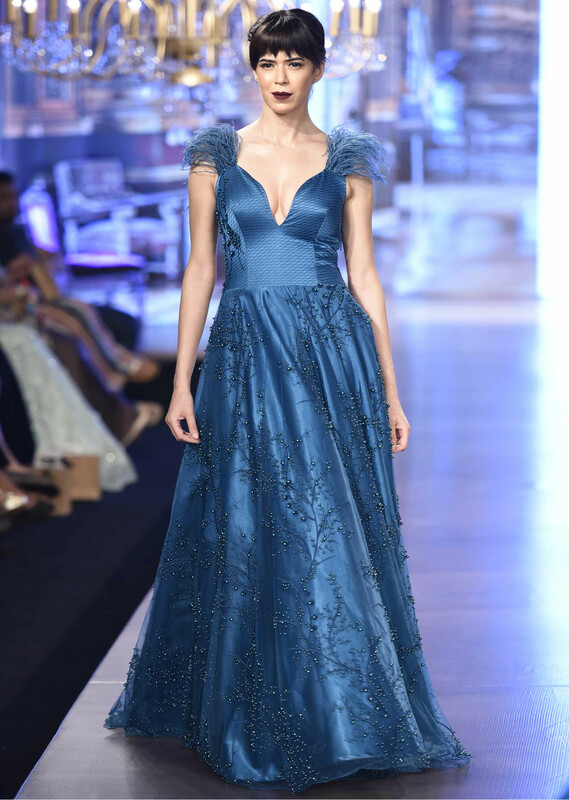 The bride’s reception outfit could be a sari inspired gown which is very much in style this wedding season,” says Nishit Gupta, Director, Kalki Fashions. The Naina Jain Bridal Collection reminisces the quintessential moment of the big day in the life of the bride. “These days, more and more brides are going the traditional way, when it comes to their attire- traditional sarees which boasts high on weaves and hand tie and dye technique. Our collection is a celebration of timeless pieces of art which every bride would like to preserve and continue to wear during any time of her life, without ever getting bored of it. 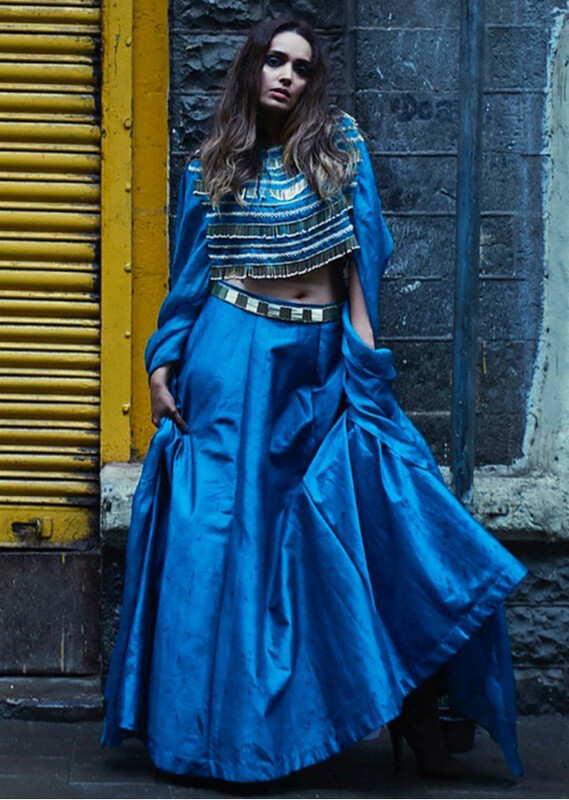 Moreover, our bridal wear incorporates experimental colour schemes like browns and beiges, which were not ever considered for bridal regalia,” says Naina Jain, Owner & Chief Designer, Label Naina Jain. Today, bridal wear has a very broad spectrum, it not only includes those heavily embroidered lehengas and embellished sarees but it has a good mix. “Rich Anarkalis with Ethnic Skirts, subtle yet rich Crop Tops with Lehengas paired with beautiful capes, Statement Pieces like dhoti sarees and obviously a wide variety of customised Punjabi jutties to go with every ensemble for different ceremonies. Definitely, the new Indian bride has stepped out of that traditional way of dressing and has adopted what is called contemporary and comfortable dressing .They want to have multi-purpose pieces in their wardrobe which are not occasion specific but are more of a day-to-day wear pieces translated into a Bridal Trousseau which can be worn in their wedding ceremonies which are spread over a couple of days like Mehendi, Haldi, Sangeet, Pre-wedding cocktail, Post-wedding party and the numerous amount of family dinners which happen post-wedding. Obviously, they cannot skip work so their fashion has to be convertible and comfortable,” says Nidhi Yadav, Fashion Designer & Creative Head, AKS. Brides today are more experimental and practical in choosing their bridal outfits. They are splurging on something that they can wear again post their wedding. “Banarsi Lehengas with a cape/shirt for the sangeet, a nice draped formal gown for the sangeet, traditional embroideries for the pheras and a lehenga saree for the reception is working well. Dhoti sarees and palazzo sarees are going on since a few years and is working well as it is very convenient to wear it even at destination weddings,” opines Disha Doshi, Designer at Disha Doshi Gandhi. “Bridal lehengas in off-beat colours are becoming popular and this ranges on one end from dark colours like olive and deep greens, burgundy and wine and mustards to the other end of pastels colours, such as light green and pink are increasingly favoured. Brides are looking for customized bridal outfits and experimenting with blouses and sleeves are very big this year too from ne-shouldered, cold-shouldered, capes, bell-sleeves and more,” says Sanna Vohra, CEO, The Wedding Brigade. Sana Karim, Designer, House of Zardoze adds, “we are recently seeing brides breaking the norms of deep red colours for their bridals and be more experimental with colours for their big day. Also the embroidery and cuts have seen visible shift in design and look. Girls nowadays are choosing abstract designs for their embroidery on their lehangas, 3D embroidery, layered lehangas all that look like gowns as well as heavily embroidered jackets. Metal wire to create 3D draped looks, fabric manipulation, mirror work and machine applique work on the embroidery is a favourable trend. We can see a lot of feather work as well.” Ruchi Roongta & Rashi Agarwal, Founders, Ruceru advice, “for the mehandi go for something fun and pastel colours, Asymmetrical hemline, easy and lightweight, we have a pastel pink jacket cut blouse and sunshine yellow can be teamed with floral accessories and dewy makeup. Cocktails can be a fresh change from black and gold, the bride of 2017 can try the unconventional neutral colours with a pop of shimmer, we have a powder blue cocktail gown with shimmer white sequin embroidery and a flattering neckline to accentuate the collar bone giving enough room for wavy hairdo. Offbeat colour combinations yet keeping the ethnic flavour intact, our bird lehenga has a lateral colour block of vibrant blues ranging from powder to Prussian tones and having a contrasting heavily embroidered blouse and dupatta. It touches the playful side of the event yet keeps it rooted traditionally. Layered and immensely flared up sheer lehenga gowns are trending this year, our tonal peach orange organza lehenga with intricate hand embroidery throughout the layers. Weddings are corely rooted to traditional rituals and we feel the ensemble should also compliment the same; greens have been a major highlight for 2017 and a dark olive lehenga with intricate zardozi work and contrasting high neck blouse with dainty dupatta with a cascading veil will bring out the goddess bride look. A high bun with deep khol eyes and traditional jewellery will add to the grandeur of the look. Reception can be experimented with English tones like butter and old rose, our raw silk flap organza gown with small floral bunch detail is sure to look very classy and chic for the final event of the ceremonies. Hair with white roses and diamonds on the neck will complete the look.” So, dress up and shine on, after all it’s a say that comes once in a lifetime!